高山流水(High Mountain and Running River, Gao Shan Liu Shui, Guzheng, 古筝曲 ), Guzheng (古筝, Zither) Solo, was composed by Bo Ya (伯牙) before 221 BC. Listed as one of ten best ancient Chinese music pieces. There are two variants: Guzheng (古筝) and Guqin (古琴). 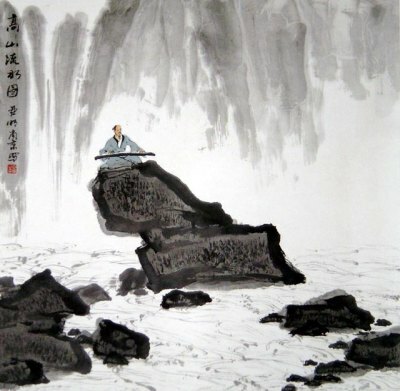 Guqin (古琴) version of 高山流水(High Mountain and Running River, Gao Shan Liu Shui) is usually considered as the original one. Guzheng (古筝曲) version is significantly different from Guqin version and was composed by later musicians based on the same story. “High Mountains Flowing Water” has lyre and zither versions, both inspired by the classical allusion: Boya encountering a person who understands his zither performance. Whatever Bo Ya thought of Ziqi would never fail to understand. Bo Ya said, ‘Amazing! Your heart and mines are the same!’ When Ziqi died, Bo Ya broke the strings of his zither and vowed never to play the zither again. The length of 高山流水(High Mountain and Running River, Gao Shan Liu Shui, Guzheng, 古筝曲, zither) is 5’58”. Enjoy 高山流水(High Mountain and Running River, Gao Shan Liu Shui, Guzheng, 古筝曲) in your browser now (just click the Play button below). This works if you browser supports HTML 5. Most browsers should support it by now. 高山流水(High Mountain and Running River, Gao Shan Liu Shui, Guzheng, 古筝曲, zither)乐曲长度为 5’58”. You may buy more Guzheng and Guqin music CDs or MP3s from Amazon. Here is the list of recommended Guzheng (古筝) music CDs and MP3s.